In between Bishan and Marymount MRT lies Trattoria Da Mimmo. It is an Italian Restaurant with humble beginnings and traditional classics sandwiched between industrial and residential areas. Its interior is a more homely, family-styled setup with alfresco like decor (but indoors of course). After settling down and ordering the dishes, our appetizers soon came. First up was the Burrata E Parma, (S$32.00) which is essentially Burrata Cheese and Parma Ham. Simple and yet absolutely delicious. The extremely creamy and milky flavours from the cheese paired with the saltiness of the Parma ham was absolutely wonderful. Next up was the Fritto Di Calamari (S$20.50) or also known as Calamari. The batter wasn’t too thick and it was nicely fried – crispy on the outside and chewy inside. It was also nicely seasoned with a dash of salt. The Focaccia Romana E Pomodorini was pizza bread topped with herbs and tomatoes (S$11.50), was served soon after. A very simple dish with subtle sweet and salty flavours. 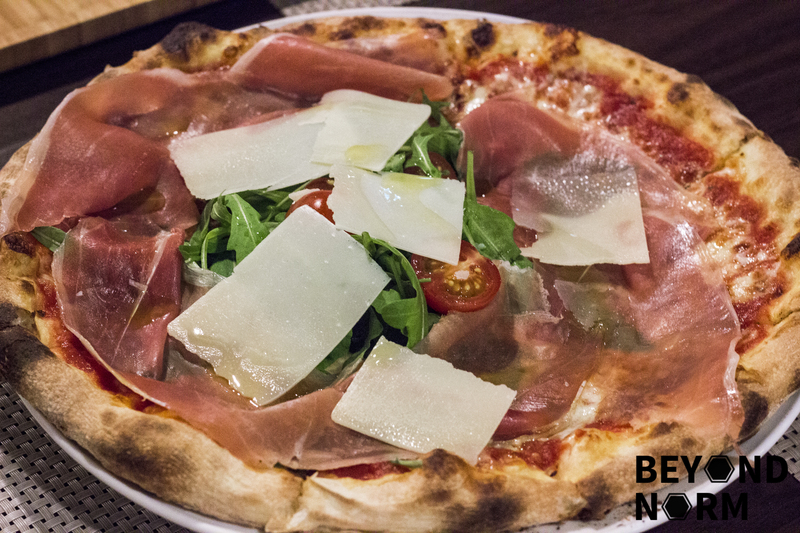 The Rucola R Parma (S$27.50) is a classic parma ham and arugula pizza. It was a classic Italian thin crust pizza, crispy outside with a nice soft, chewy interior. Their tomato base was more rustic. Their Panzerotti Di Ricotta E Spinaci (S$24.50) was reallllyyyyyy goooooood. The pasta was stuffed with spinach and generously coated with their porcini truffle light cream sauce. The moment it hits the table you can smell the truffle, which was simply heavenly. The pasta skin was nice, thin, and the insides were also stuffed with a little cheese which really elevated the flavour. AAAAMMAzzingggg!!!! Their Penne Amatriciana (S$19.00) is another simple classic: bacon, parmesan and onion with tomato sauce. It leans towards the sweeter side with really rustic flavours. Its texture is chunkier, and the bacon gives it the right amount of saltiness which blends the dish together perfectly. Unfortunately, their desserts were disappointing and really not their strong point. However their Cappuccino (S$4.50) is pretty good. It was smooth and closer to the bitter spectrum of coffee. This is definitely a restaurant that I would come and visit again.